Sideshow life displayed in book! After 39 years as a magician with circuses and carnivals throughout the United States, there aren't many magic tricks Howard Bone doesn't know. But that doesn't mean he's about to destroy the mystery other performers create. Friends will often mention a feat they've seen a magician do on television and ask, "Did you see it?" Bone, who's a fan as well as a retired performer, will answer yes and wait for the inevitable next question: "How did he do that?" He has two stock answers: "Very well" and "With lots of practice." 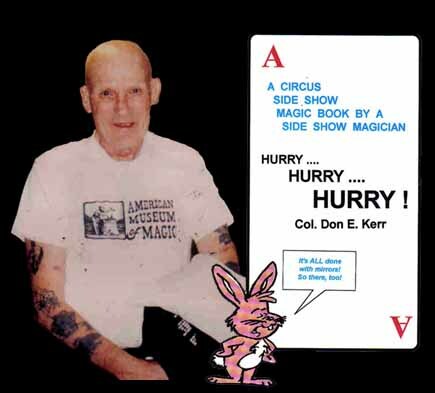 But if you want to know how Bone did his magic tricks-when he was known as Kard-O the magician - dip into the pages of "Hurry ... Hurry ... 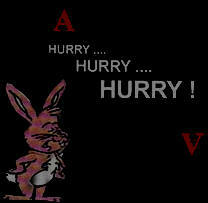 Hurry!" It's Bone's account of life as a sideshow magician. Robert Lund, curator of the American Museum of Magic in Marshall, Mich., says it's "the best book of its kind ever written." His book includes escape tricks, rope tricks, sward tricks. And it includes the patter that goes along with the stunts he perfected over the years, "cleaned up," Bone explained for family consumption. The book also includes tips for dealing with hecklers. Besides performing, Bone also would drive circus and carnival trucks, "except for the elephant truck. The animals keep moving around and it's too hard to keep control." But he was grateful to elephants once when he was driving in a circus and stopped in a Missouri town. It had been raining earlier, the baseball diamond where the big top was going up was wet and Bone - following instructions to "swing around toward the fence" - got stuck. It took the elephants to push his truck out. Bone, now 68, said a circus-carnival life "is a hard life. You're out in all kinds of weather. You don't make much money. It's an easy life to quit . . . . I know, I've quit 100 times." The last time, about 14 years ago, was for good because of declining health. He returned to Evansville, his home town, where he now lives at Buckner Tower.